The next leg of Tufinnovate, our annual user conference, took place this week. We were especially excited to host customers, partners, and analysts in our new US home, Boston. 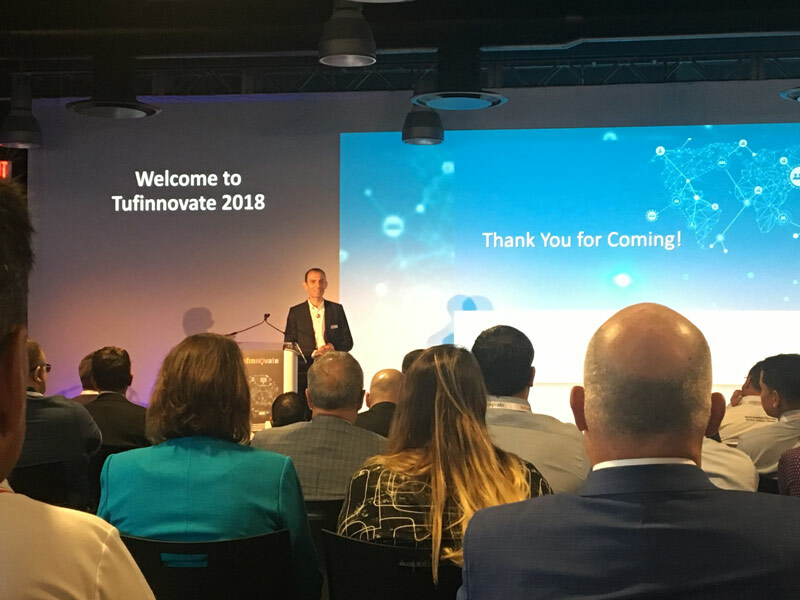 In true Tufinnovate fashion, the event included the popular Expo, keynotes from CEO Ruvi Kitov and CTO Reuven Harrison, a look at the product roadmap with VP of Products Ofer Or, an analyst meeting, breakout sessions, and roundtable discussions. Here are just a few of the highlights from the show. Throughout the Expo area, many conversations centered around the need to balance security and agility and how customers are leveraging Tufin Orchestration Suite to do so. In fact, our customer Capital One presented their case study, outlining how the organization has used Tufin SecureTrack and SecureChange to meet business goals. Specifically, the customer talked about how rule cleanup, compliance reports, and change automation have increased productivity and reduced costs. Similarly, the customer panel on the last day of the event highlighted how four organizations have solved their network security challenges with Tufin’s solutions. One customer compared Tufin’s solution to “magic” in the way it’s helped him to free up man hours and increase efficiency. These customers’ use cases and insights truly highlight the value that Tufin delivers to even the most complex enterprises, saving time and costs, meeting compliance demands, and ensuring a strong security posture. Back by popular demand, we were excited to welcome independent security researcher Samy Kamkar to the Tufinnovate stage. Samy spoke at last year’s Tufinnovate in Frankfurt. A “gray hat hacker,” he is best known for creating the MySpace worm, the fastest-spreading virus of all time. During his session, Samy outlined several very real, very frightening attack scenarios. Security is constructed of minute pieces of data that are shared everywhere. Take passwords, for example. Many of us are guilty of using the same password across all or most of our applications and bank and credit card accounts. That one password, however, is too often the key to nearly all of our personal information. Samy described how Wired editor Mat Honan was hacked when attackers cracked his Amazon password. Overnight, Mat’s digital world was turned upside down. While Samy’s advice was meant as a joke, the sentiment behind it carries some truth. When it comes to security, it’s all about going back to the basics. This is where Tufin comes in. Our solutions allow enterprises to take a step back from the complexity that they’re constantly up against in order to gain visibility across the network. Visibility is key. Without it, you have no way of knowing what is on your network, let alone how to begin to secure it. And as noted by our CEO Ruvi Kitov, there is no end in sight for network fragmentation, which only makes visibility more difficult to achieve. Setting a foundational security policy is the first step towards the Holy Grail of the network security world: Zero-Touch Automation. For more highlights from Tufinnovate Boston, check out this article in CSO Online by Jon Oltsik, ESG Senior Principal Analyst and ESG Fellow. Jon provides a first-hand look at topics covered during the show and his key takeaways. These conferences are just as beneficial to us as they are to our partners and customers who attend. Armed with key insights into how our users are working with Tufin Orchestration Suite, and new features they’d like to see in the future, we are in an even better position to lead the network security automation market. Thank you to all our guests for making Tufinnovate Boston such a success. We hope to see you again next year!